Khalifa bin Zayed Al Nayhan (also known as Sheikh Khalifa) was born on 25 January, 1948 in Abu Dhabi. He is the son of Sheikh Zayed bin Sultan al Nahyan, whom Khalifa succeeded after his death on November 2004 as the Emir of Abu Dhabi. Sheikh Khalifa also acts as the chairman of Abu Dhabi Investment Authority, a sovereign wealth fund that manages over $600B in assets and handles the Emirate’s excess oil reserves, estimated at $500B. Sheikh Khalifa’s prosperous political career did not begin with his ascension to the presidency. As early as 1966, after graduating from the Royal Military Academy Sandhurst and following his father assuming the role of Abu Dhabi’s new ruler, Sheikh Khalifa was appointed as Ruler’s Representative in the Eastern Region of Abu Dhabi, and as the Head of the Courts Department in Al Ain. In 1969 Khalifa was nominated Crown Prince and soon after he became the Head of the Abu Dhabi Department of Defense, where he administered the forming of the Abu Dhabi Defense Force (ADDF). Under his successful leadership, the ADDF became the core fighting force of the United Arab Emirates (UAE), which gained its independence in 1971. 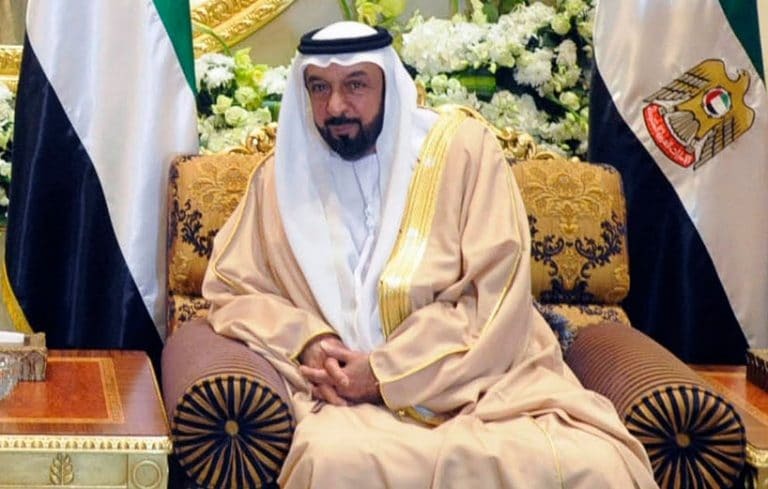 Following the formation of the UAE, Sheikh Khalifa assumed the role of Prime Minister of Abu Dhabi, as well as Minister of Defense and of Finance. Since 1980 he acts as head of the Supreme Petroleum Council, which owns the oil company of the UAE, the fourth largest oil company in the world. Despite assuming this position officially only after his father’s death, Sheikh Khalifa has been effectively acting president during the time of his father’s poor health. Accompanying his affluent political career are the Sheikh’s generous contributions to medical, environmental, and educational organizations. One of Khalifa’s outstanding donations to the field of medicine is the $150M he gave to the M.D. Anderson Cancer Center of the University of Texas in 2011, to establish a cancer treatment clinic, as well as research programs directed at finding innovational ways to diagnose and treat cancer. Also in 2011, Sheikh Khalifa launched the UAE Pakistan Assistance Program. The program was aimed at providing Pakistan with the resources needed to develop proper infrastructures that will take into account the harsh weather conditions of the area. The program placed emphasis on redeveloping social affairs, namely health, education, water and infrastructure. The program had positive outcomes with the building of numerous schools, hospitals, and water supply schemes. The Sheikh was also the chair of the Environmental Research and Wildlife Development Agency. Several monuments and buildings have been named after Sheikh Khalifa in honor of his considerable contributions. Amongst these are Burj Khalifa, previously known as Burj Dubai, the tallest artificial structure in the world, and a building in the theology department at the University of Wales.